Do you think lawyers only write motions, briefs, wills, and contracts? Think again: a lot of lawyers write blogs. Why? To share information, to express opinions, to establish their expertise, and to market their practices. Why read them? To learn about new developments in different fields and the lawyers who practice in those fields. We have revamped our guide, Law-Related Blogs in Washington State. You'll find blogs on a wide variety of topics, from IP to DUI defense, from bankruptcy to international development. 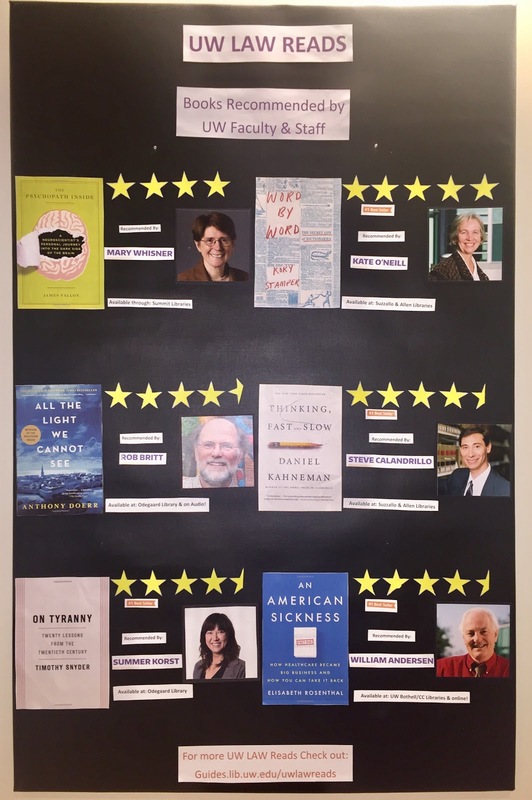 Now that finals are over and summer is upon us, how about some summer reading recommendations from UW Law faculty and staff? Since 2015, we have added to a research guide that contains book recommendations from the UW Law community. Whether you prefer literary fiction or memoirs, prize-winning nonfiction or escapist fantasies, or are just looking for some new recipes for summer picnics and parties, there's likely something that suits your tastes on our reading list. 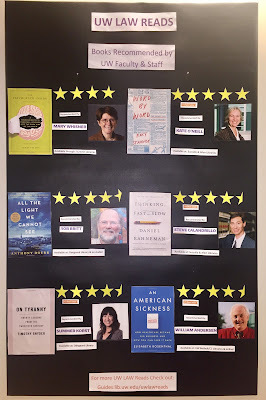 A new display in the entrance to the law library features some of these faculty and staff recommendations. De-stress with Art in the Library! Need a quick and mentally stimulating study break? Look no further than the walls and shelves around you! 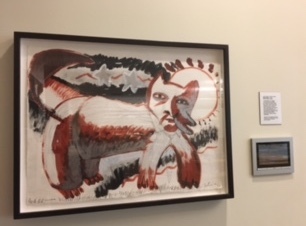 You may have noticed some of the wonderful artwork displayed throughout the library and wondered where it came from. Much of it is part of a contemporary Native American Art collection put together by artist John Feodorov. This helpful map can guide you as you wend your way through the stacks and carrels to view all the entire collection. In addition, this page provides information about the artists who created the works and includes their comments on the pieces displayed. "Skinwalker" by John Feodorov (2000). On display behind the Gallagher Circulation desk. As an added bonus, your art viewing session may help to decrease any built up finals-related stress. In a study completed by researchers at the University of Westminster, London city workers were asked to spend 35 minutes in an art gallery over their lunch hour. The participants' levels of cortisol (the hormone linked to stress) and self-reported stress levels were measured both before and after their time in the gallery. The result? Individuals who entered the gallery with high levels of stress experienced a reduction in cortisol that would normally occur over a five hour period. Talk about a great use of your lunch break! If you feel the lure of the sunshine and want to get your art fix out-of-doors, the University of Washington has a walking tour designed to help you explore the campus artwork on foot.